Between having a baby, taking care of my two boys, moving houses, meeting publication deadlines and working on some projects that I hope to share with you (really soon!!! ), my poor blog has been neglected big time. I apologize for that! I’m long overdue for a post, so i’ll try (while my baby sleeps and my toddler is distracted!) to update you on what I can.As a side note: for daily updates and pictures please follow me on Instagram and Facebook (search Quilting in the Rain), as I post there on a regular basis. I’d love to have you! 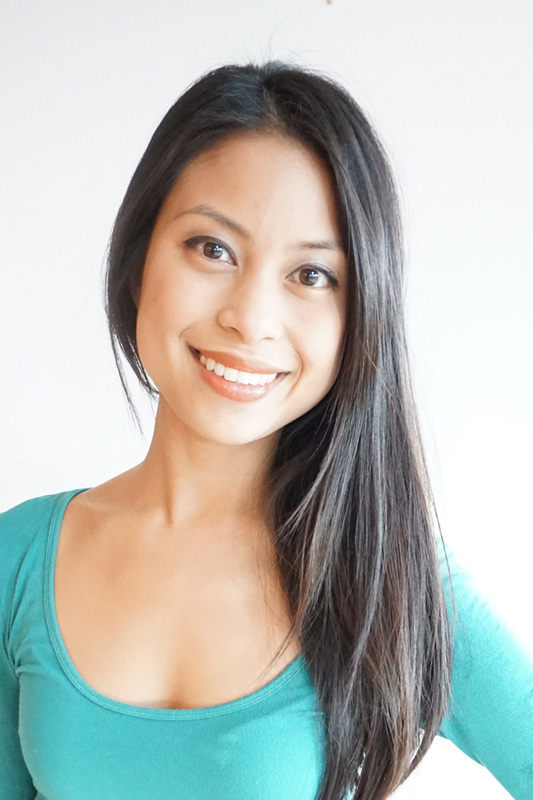 First, I’d like to share some fun and exciting news! I co-authored the following book, 75 Fun Fat-Quarter Quilts, along with 13 other popular designers. This book comes out this December, 2015. 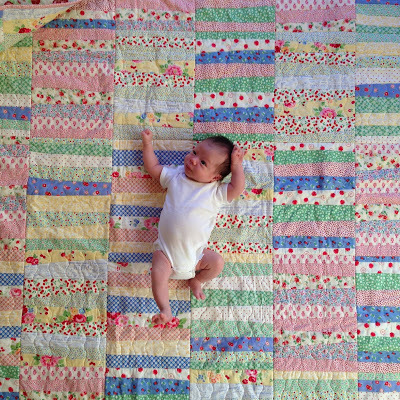 The strippy quilt, shown above and below, is featured in the book. 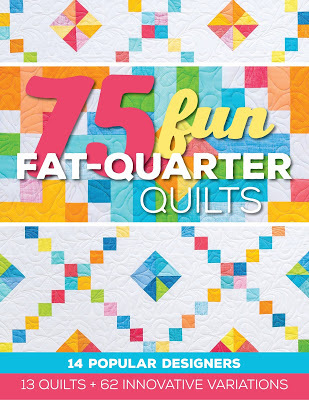 It is quick to assemble and uses almost the entire fat quarter bundle with little to no waste. I assembled it via the Quilt As-You-Go method, detailed in my other book Quilt As-You-Go Made Modern, but I also go over the technique briefly in this new book. Below are some pictures of a more recent project I finished. 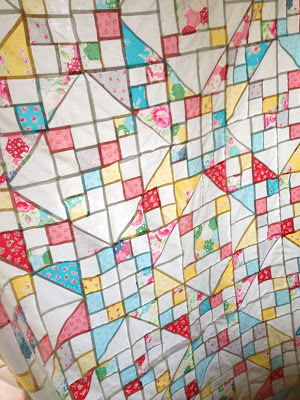 These are just some sneak peak pictures as this quilt will be published in the McCall Quilting Magazine early next year. 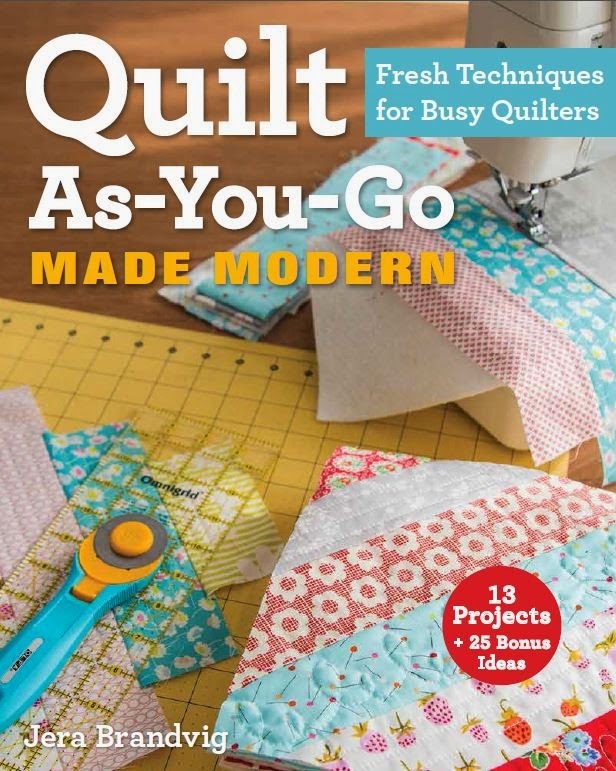 If you love the design and the fabrics, you will be happy to hear that McCall quilting will be teaming up with Lecien fabrics to make custom quilt kits that you can order through their magazine. Fun stuff! 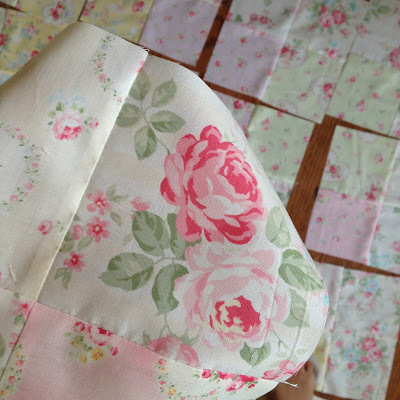 I seem to be most efficient at night time quilting, but even that can be a challenge when I’m nursing every 2 hours. 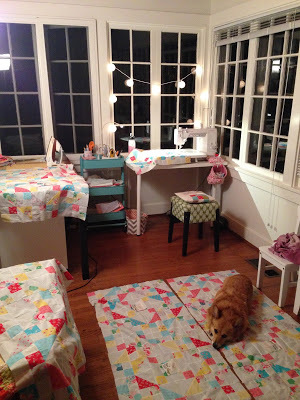 I’m honestly surprised to be quilting as much as I am having just had a baby. With my first born, I didn’t quilt for 6 months after his birth! But then I came back feeling super creative and shortly after wrote my first book. Funny how that works. 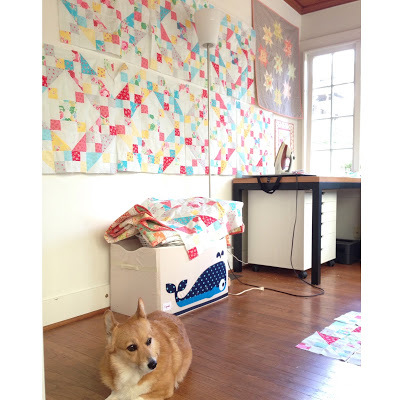 Above: my faithful quilting buddy, Paige. She stayed up with me all night assembling this one. Above: saying good night to my Pfaff. As mentioned, these beautiful fabrics were provided by Lecien Fabrics. 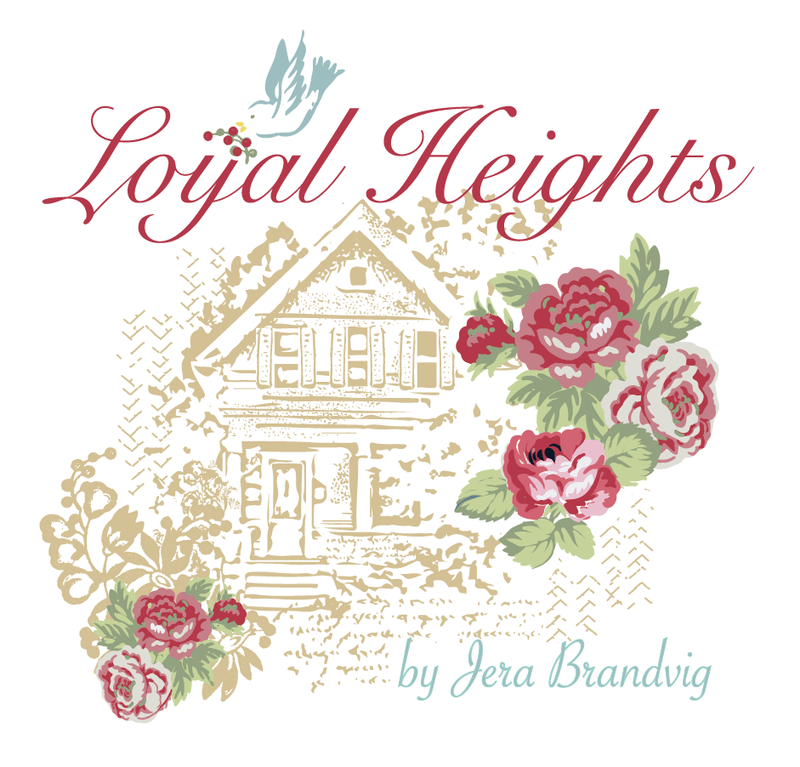 I just love their vintage vibe and soft floral designs, and the quality of their fabric (made in Japan) is excellent. This is their new Flower Sugar line that will be in stores Fall, 2015. These next two photos I had to share. I think Paige has adopted Simon as her little pup. She responds to his every squeak and loves to cuddle him. It’s one of the sweetest things ever. 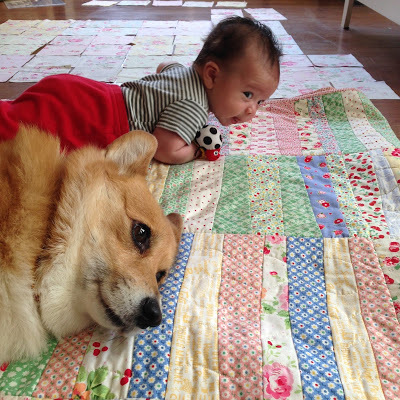 Above: Paige and Simon doing tummy time together. Life has been busier than ever and it’s been a super eventful Summer…but I wouldn’t change a thing. I love being a mama to two beautiful boys, and I am thankful for the time (though few these days) I get for my hobby. I have to really try to make time for it with the help of my husband (and grandparents!). Through the hustle and bustle of life, it’s important we make time for the things we love. Obviously family always being number one, but for our hobbies as well (our hobbies keep us from going crazy)! Enjoy the rest of the Summer and take care! 19 Responses to News from my Neglected Blog! Beautiful post! Congratulations on your beautiful family and such lovely quilts! Thanks for the update with all the wonderful photos. I, too, was missing you and wondering how you were doing. I am looking forward to buying the second book. 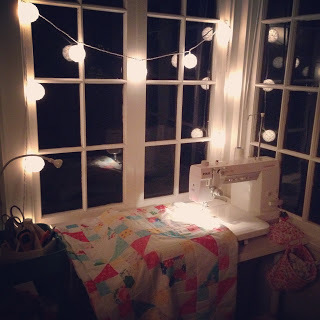 Here's to the best of both world, family and quilting! You and your boys are beautiful. Take time with them because they grow oh so fast. I have missed your post but family does come first. Your little Simon is adorable – he's lucky to have a sweet big brother and that Paige loves them both! 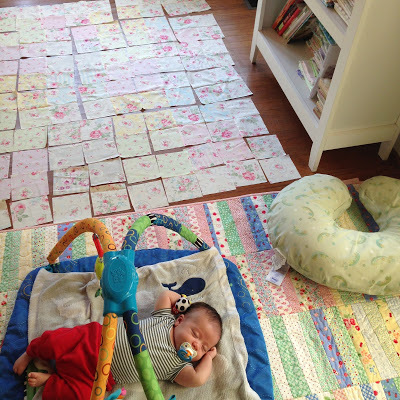 Love all your pictures – thanks for keeping us up-to-date with your growing family and all your quilting projects! Your kids – all of them – are adorable – thanks up updating – now get some sleep! 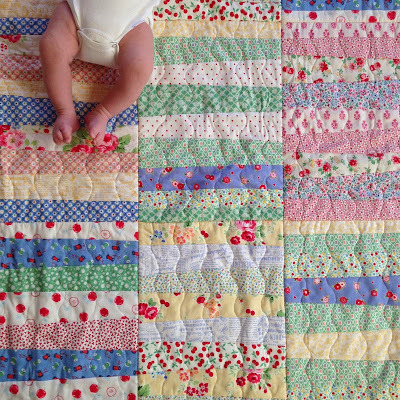 Beautiful quilts and beautiful children. Thankyou for sharing both! Welcome back! Thanks for sharing. It's great to hear from you again! You made a wonderful job. Your baby is beautiful as well as his brother. 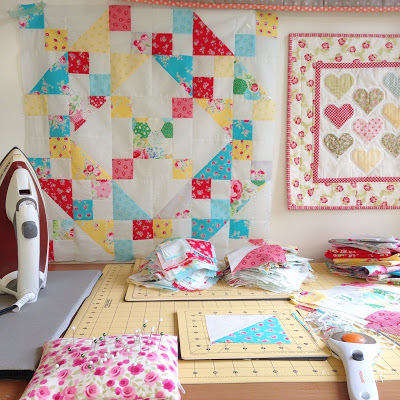 Impossible to imagine that you are able to cope with all you're doing : nursing baby and child, quilting at night, writing in you blog and working with McCall Quilting Magazine ! I am a recent and geograficaly very far reader of your blog. I appreciate it a lot. Thank you so much for everything you share with us. Have a great day ! I was so glad to hear from you again, and so happy for you and your new little one!! Love seeing pictures of your quilts and hearing about your family. You look great! I don't remember being so energetic so soon after my little ones :)! This is a great blog update to read today. I love all of the sweet photos you shared. 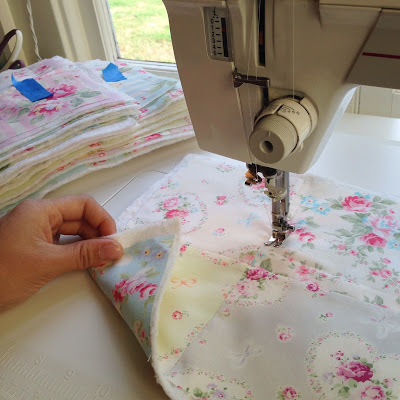 Isn't it fun being addicted to sewing and fabric? I am a faithful IG follower, so have enjoyed sweet pics of Simon and Paige, as well as sneak peeks at your latest projects! Congrats on the collaborations! 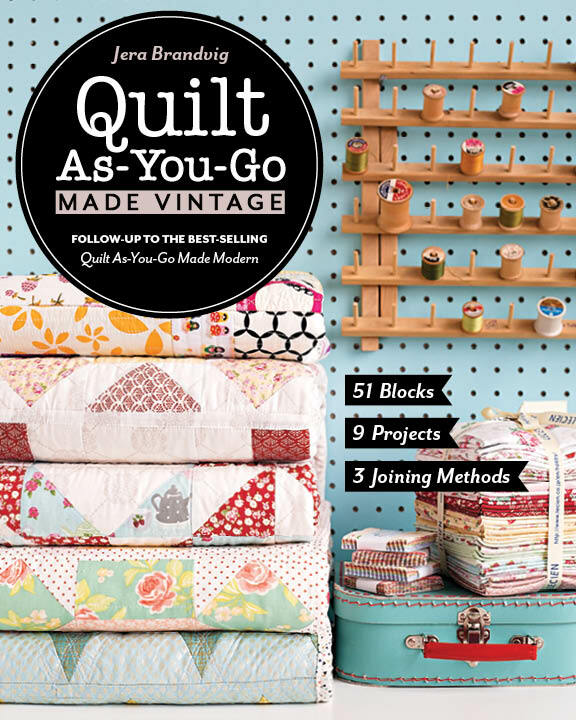 The new Fat Quarter Quilts book will be on my Christmas wish list 🙂 Love reading about your family, and admire your ability to work around a newborn! Keep on keeping on!! Nice to see your post! 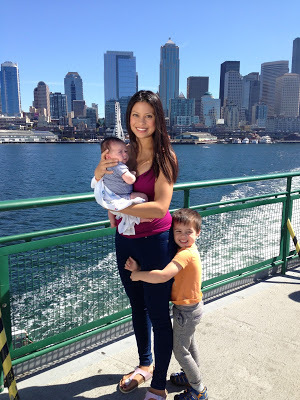 I was happy to find you on IG….you're doing an amazing job for a mama with one tiny boy and a toddler! Looking fwd to the new publications, and I'm just waiting for that new Lecien line to hit the shops. Welcome back! I've been following along on Instagram, and it's been fun seeing your family grow and all the projects you're working on. Congratulations on the new book! 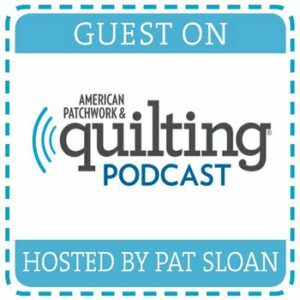 Welcome Back to the blog world and quilt world. I discovered your blog and have been reading posts off and on. Congratulations! 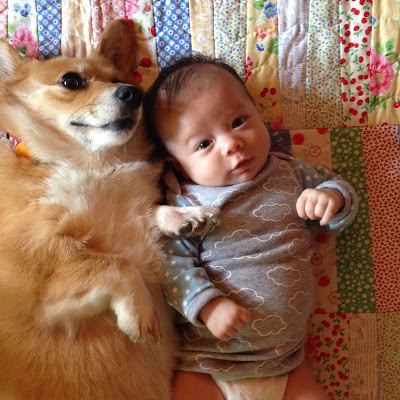 Just adorable photos, each and every one! Thank you for sharing and have a wonderful creative day! I don't know how the heck you do all that you do, but I'm always happy to see anything you share. the pic of Simon and Paige laying next to each other is the cutest ever! Congrats on EVERYTHING! You are truly blessed!